A seal pup spent the day on a boat slip in Queens, and I will never forgive myself for not thieving it and forcing it to live in my bathtub. Park services think the seal may have become stranded on the slip after the tide receded, and the little buddy was in the process of slowly making his way to the water, which was over 100 feet out. “I would be tired going down that [slip], crawling with those little fins myself,” said Michael Volk, an onlooker. By the looks of the seal‘s yawn, and it rolling on to its side, it may not be in a hurry to leave, which was fine with all the onlookers who were getting a glimpse of something you don’t see every day. We received a call today about a harbor seal pup in Queens that is possibly still dependent on it’s mother. Though the seal does not seem to be in distress, the area has been taped off so the mother does not get scared off. With the help of the NYPD and the DEC, this seal is being monitored. 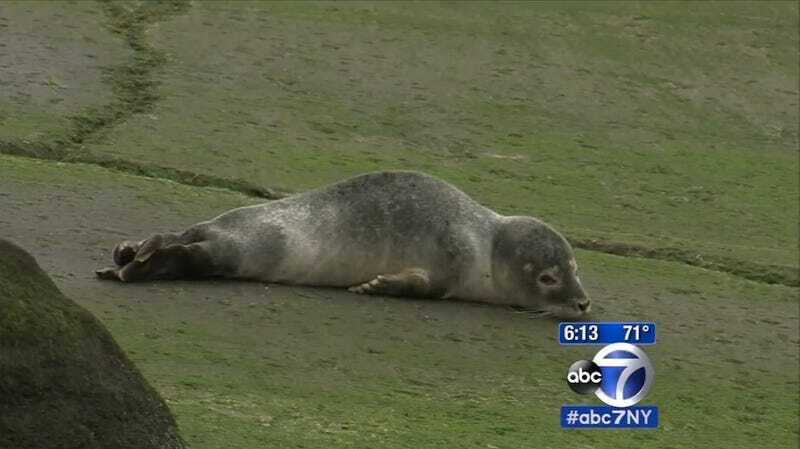 According to ABC 7, the seal has since flopped off the end of the slip into the water and is, presumably, having a very chill night at home.